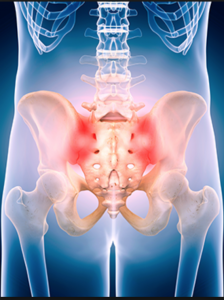 The SIJ stands for the SacroIliac Joint (SIJ), found at the base of the spine and at the back of the pelvis. This joint is extremely important for load bearing and has a role of redirecting force up through the legs and the pelvis into the spine where it can be absorbed by our custom designed intevertebral discs. As you can see, it’s team work. And like all teams, if someone isn’t pulling their weight, someone else has to compensate! Usually our friend the piriformis muscle and superficial erector spinae. SIJ can be confused as lower back pain, and in some cases can also refer into the legs via irritation of the sciatic nerve. Like most injuries, its important to find the source of your symptoms to treat specifically. Muscle Support; For the SIJ to complete its job of transferring forces or ‘loads’ into the spine, its needs the support from stability muscles such as the transversus abdominis and deep lumbar multifidus. Unfortunately in the presence of pain, these muscles have been shown to have a delayed contraction. Whereas compensatory superficial muscles are firing more often, instead turning on and off like they normally would. The SIJ is one of our favourite areas to treat because with a little bit of TLC and specific exercise, it can find it’s flow again.